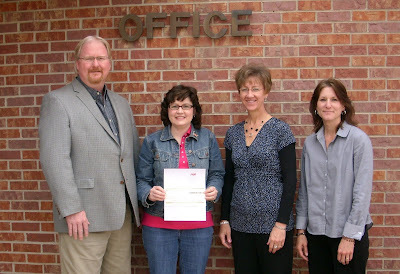 Pictured from the left are FNIA President Ed Mark, Exeter Village Clerk Becky Erdkamp,FNIA Agent Kay Due and FNIA Agent Diane Geiger with Becky holding the check the village recently received. The Village of Exeter received a check for $2991.46 as a dividend from the Municipality Safety Dividend Program as part of their EMC Municipality Safety Program (insurance) provided through First National Insurance Agency, Inc. in Exeter. This represents a 10.4% dividend.